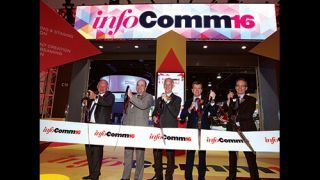 Yesterday morning, InfoComm International officers cut the ceremonial ribbon to officially open the show floor to the tens of thousands of attendees who have descended on Las Vegas from around the world. Beyond opening the booths of the 1,000-plus exhibitors, numerous other aspects of the show also got underway, including the InfoComm Career Fair, Live Events Forum, and pavilions on the show floor, including the much-anticipated Internet of Things (IoT) Pavilion, in which InfoComm leadership has invested much effort. Also underway are the full slate of InfoComm University classes, which association members can attend to an unlimited degree for a fixed price. With the show now fully in session, Labuskes urges all attendees to make the most of the myriad opportunities at hand. “I think this show accurately reflects the amount of work we’ve been doing to re-engage our membership as an association and to re-illustrate our value as an association,” Labuskes said.